Jaman, which sells high definition movie downloads (rental and to-own), has announced that it will soon be releasing a plug-in for the AppleTV. 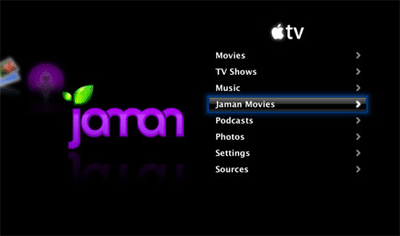 With the software installed, Jaman movies will appear as a new menu option alongside existing content choices, which include television shows and movies downloaded via Apple’s own iTunes store. Although hackers have already had success adding new features to Apple’s set-top-box, this is the first known effort by a commercial company aiming to plug their service into the device to create a level playing field with Apple’s own content offerings. Jaman has done a great job of (unofficially) integrating their service with AppleTV, and the experience was as seamless as say YouTube. But more importantly, the visual quality on a big screen plasma screen was stunning… scratch that, breath taking, when compared to Apple’s own video offerings. If Apple were to allow third-parties to plug their services into its set-top-box, then the company could really achieve its ambition of making the AppleTV a DVD player for the Internet age. Ultimately, the decision will be a commercial one, and in contrast to the iPod where margins are high, it’s been reported that the AppleTV isn’t nearly as profitable, so it maybe that the company is hoping to make up revenue through selling television and movie downloads via its iTunes store. If this is indeed the case, then it would explain why Apple is keen to keep out Jaman and other competing services. For more information of Jaman’s offering, check out Robert Scoble’s excellent video profile of the company. As an AppleTV alternative, you might be interested in ToxTox. It tries to offer the same TV experience as the Apple TV, but is built around an open architecture, based on Firefox. The beta version looks promising already!